Photo, above: Orlando Trump-hater attempts to steal a Trump yard sign from his neighbor’s yard, only to be shocked by the inhospitality of his neighbor, who not only electrified the sign but also videotaped the attempted theft, then had the would-be thief arrested and charged with trespassing. The three frames show the luckless Trump-hater bending over to steal the sign, then showing off his impressive three-inch vertical after being zapped, then whimpering back home to wait for his ride to the local jail. There was an epidemic of liberal weenies stealing and vandalizing Trump yard signs in 2016, before and even after the election. All of us patriots want to support our president in 2020 but are worried about the potential for theft, vandalism, trespassing on our property, and possibly worse. As a public service to patriots from sea to shining sea, we at Powdered Wig have scoured the interwebs for Trump sign defense systems. We found many, but the most creative and fun to watch are videos of electrified Trump signs, a simple and ingenious system designed to shock the would-be thief with a blast of retribution. This first video, which comes to us from tweeter White People, identifies the clever, practical joking homeowner only as “this dude.” We have since named him Karma. Watch as an evil liberal weenie trespasses onto Karma’s property and attempts to steal his sign, receiving the shocking message that his attempted theft is not appreciated. Liberal weenie loser #2 is a moron in Orlando, Florida who decided to steal his neighbor’s Trump sign and was shocked, then arrested and charged with trespassing. He does the liberal weenie dance all the way back to his own yard before the police arrive and haul him away. And, how about this hero. 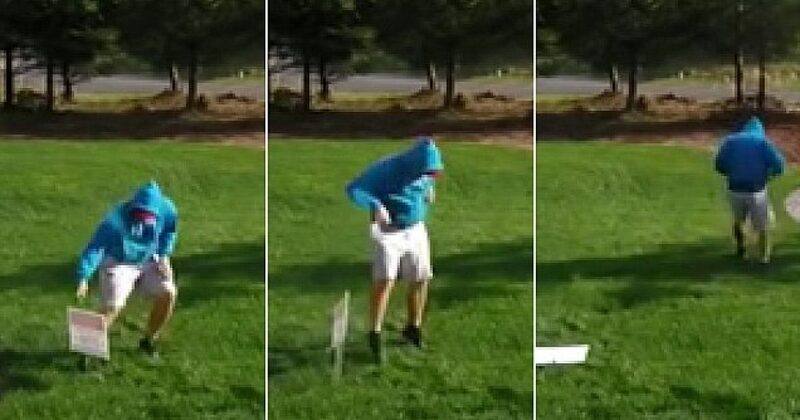 He kicks a Trump yard sign down not knowing that it is electrified, then decides to add a little insult to injury by taking a healthy whiz on the downed sign. He and his unfortunate member are shocked by the instant Karma as he bends over in pain while attending to his wounded weenie. So, fear not, fellow patriots! You can support your president in 2020 with the comforting assurance that your property will not be stolen or damaged. With a little electrical wire and a security camera, you can also have a ball watching the instant Karma from your garage with your pals and a keg of beer. Party on, patriots!